Why a cargo bike might just save your life. Sometimes modern life, with all its frantic multitasking and rushed relationships, leaves us feeling half-dead and disconnected—often while stuck in traffic. But you have the power to escape the stressed-out status quo and embrace what really matters: family, friends, and freedom. And shifting your life toward a happier future is easier than you might think. It can even begin with something as simple as a bicycle. Not some one-trick pony like a race rig or downhill charger, mind you. The simplest way to save your sanity, fight the good fight, and have fun doing it? Rock a cargo bike. For more and more of us, it’s become the ultimate life hack: park the car and hop on a haul-it-all cargo bike, whether it’s pedal-powered or has an electric boost. Like a book, a bike is a magical thing that transforms the user. Cargo and utility cycling refreshes our minds, sharpens our senses, undermines our anxieties, and makes us fitter, healthier, and friendlier—all while we’re just out getting stuff done. Why burn gas and spew exhaust when you can burn calories and breathe fresh air? Take the kids to school, pick up groceries, commute to work, go camping, enjoy a night out, meet the neighbors, spend some quiet time alone, spin the globe… whatever you want. You can do it all with a cargo bike (or an e-cargo bike, if you like). And the best part? It’s not just good for you; it’s good for everybody. Our precious little planet needs more utility cyclists, cargo bikes, people-friendly cities, and other smart solutions to a host of big problems. And we all need to be brave enough to reconnect with the real world, to enjoy the moment with our hearts set on a better future. Join the Xtracycle community and help us lead the movement toward sustainability and a slower, sweeter lifestyle. You’re not alone. You can replace a car with confidence—and pedal your way into a new world. We’ll be right there with you, hauling pizza, maybe a kid or three, a little vino, and probably a Frisbee, just in case. 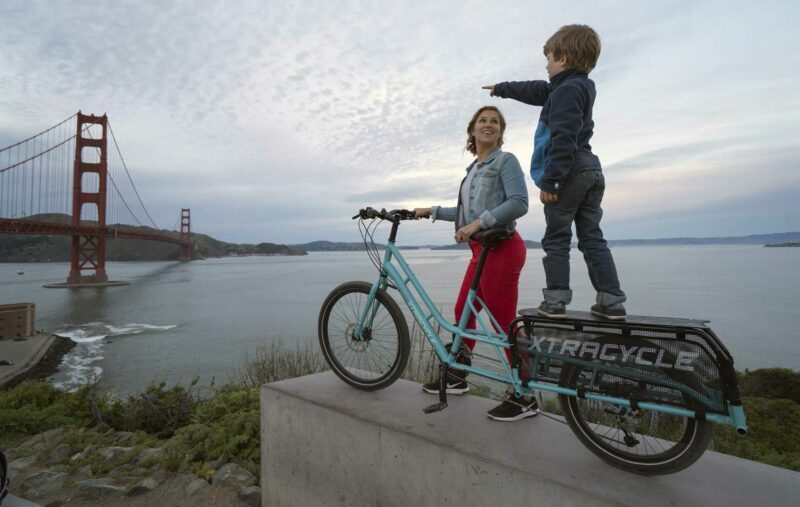 See how the original—and most innovative—cargo bike can transform your health, your family, and your world. We dare you.